Hey everyone, and welcome to yet another edition of Feature Beer Friday. Tag your beer posts with #FeatureBeerFriday to follow along and home and share what you're breaking out today! 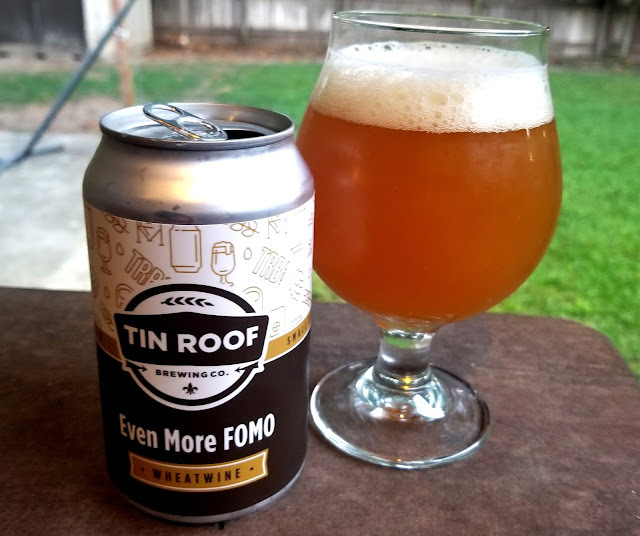 I'm coming to you all with another beer from local brewery Tin Roof, making this their third appearance on Feature Beer Friday. I promise that's not just because I used to work there, but it does have a lot to do with all the new releases they have been putting out week after week. First, I featured their Juju Imperial IPA (now named Santeria) and then the Haze Hunt Triple IPA, and now it's time for the Even More FOMO Wheatwine! Even More FOMO is a wheatwine, which is akin to the barleywine, except quite obviously, more wheat in the grain bill. Like a barleywine, a wheatwine isn't actually a wine at all, but a strong ale, falling under the American Strong Ale category by BJCP standards. They descripe the style as "A richly textured, high alcohol sipping beer with a significant grainy, bready flavor and sleek body." In addition, they acknowledge that the style is relatively new and still being developed, which leads to a "range of interpretations." Tin Roof definitely took the hoppy interpretation on their version, which clocks in at approximately 11% alcohol. The appearance is definitely on par with a hazy IPA but a little darker and into orange territory. The aroma is citrusy, with a bit of sweetness from the grain bill but primarily just hoppy goodness. On the tongue though I get more piney resinous hop flavors, along with a silky smooth mouthfeel from the all the wheat. The 11% alcohol is extremely well concealed, to the point where I feel like this could sneak up on some unsuspecting drinkers. Overall though, another winner from Tin Roof, this wheatwine is on the verge of being an Imperial IPA with a wheat base, and will surely satisfy hopheads and traditionalists alike. As of Thursday (May 3rd) afternoon it was still on tap with plenty of 4-packs available as well, so swing by and give it a try!